Following my recent revelations about the jian, I have finally “bitten the bullet” and purchased two “real” jians. The first of them is my lovely Hanwei cutting jian designed by noted Chinese sword authority Scott Rodell. This jian is the one I plan to use for cutting practice. Scott designed this after having handled over 3000 antique jians; it is not a plaything, nor a display piece, nor a brute “cutter”. It is finely balanced jian, that is both historically accurate and specifically designed for cutting. A video showing me unpacking my Scott Rodell cutting jian. A video showing the dangers of swinging, never mind cutting with, sword-like objects. designed as “brute cutters” with little or no thought to the manner in which a jian was intended to be handled (in particular, failing to ensure a correct point of balance). In order to use it for cutting practice, I’ve had to construct a special cutting stand to accommodate plastic bottles and other objects. I'm no handyman, but I think you'll agree from the adjacent picture that it worked out okay - especially for a job that took me about an hour all up. I’ve purchased the wood for a second stand dedicated to cutting tatami omote (rice bundles) but the construction of it can wait. My current stand is more than enough for now. After more than 3 decades of weapons training I thought I'd be just fine with cutting. I couldn't imagine not having it pretty much "down pat". After all, I'd spent years doing bokken, arnis/escrima/kali and Okinawan kobudo. A lot of my practice involved hitting targets - at which I've become reasonably adept: I can impart a lot of force with my blows. Cutting had to be similar - right? Not exactly. I found my backhand was pretty good, straight off. But my forehand was rubbish. Out of the first 20 or so forehand cuts, only 4 were really clean and accurate (thankfully, 3 of these were the last 3, so I know I'm on the road to improvement). What had happened? Quite clearly my form was not as good as I'd assumed. I had enough momentum and focus all right; what was lacking was my wrist angle and the consistency of that angle during the cut. I found my wrist was wavering a little mid-flight. This caused the water bottles to fly off the stand (even though they were cut in half). With the backhand I was able to cut them cleanly in half without the bottle shifting off the stand at all. So in order to refine your technique and ensure your movement is correct, you simply must do cutting. There is no substitute. Air cutting can only take you so far. 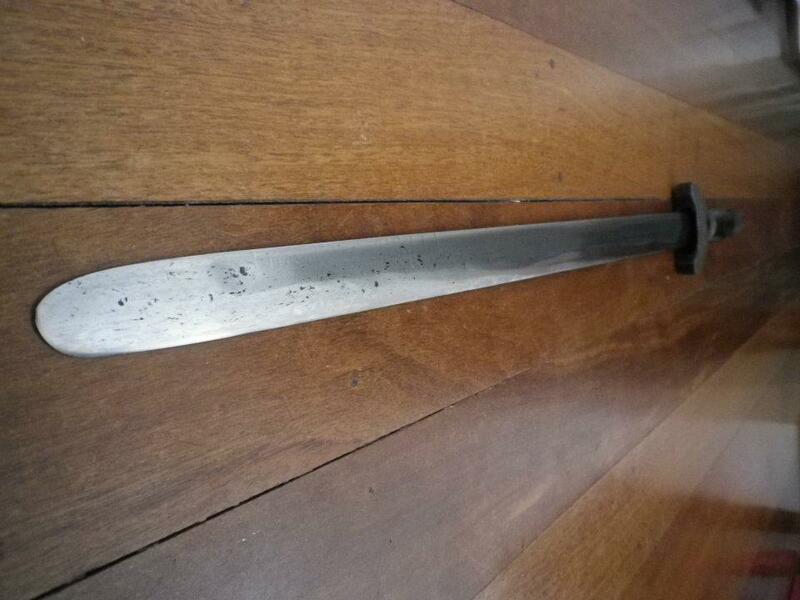 The second jian I’ve recently purchased is an antique. I have named it 金龍 or "Golden Dragon". 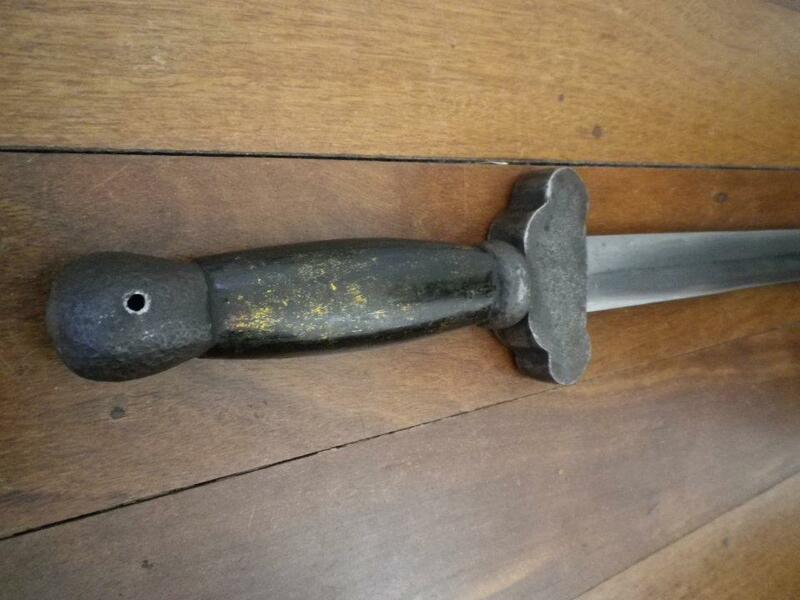 I think it is probably a Qing dynasty sword and I estimate its age at about 200 years. It bears the upturned guard of the earlier Ming dynasty jian, however this style did survive for some time into the Qing dynasty, especially in the northern rural areas. The sword is a slightly "up market" village jian: it is really quite unadorned and utilitarian in its design, however it makes one important concession to aesthetics, ie. the scabbard and handle which are made of bamboo, painted black and sprinkled with what appears to be gold dust, then covered with clear lacquer. This detail tells me that the sword was some family's heirloom as well as being a pragmatic tool of civilian defence. I intend to honour that family by keeping the sword in good condition. Since receiving the sword I've removed some surface rust from the fittings using oil and light rubbing and it has come up a treat. From now on it will be easy to maintain. A video showing my antique jian - “Golden Dragon”. The sword otherwise bears the hallmarks of a village kiln, with pitting due to impurities in the metal. The sword is typical of functional swords of years gone by in that its blade is noticeably wider and heavier than most ceremonial or dress swords today. The swordsmith did a fairly good job apart from this, and the blade shows signs of differential hardening, including a just discernible "hamon". It is also clear to me that the sword did, at some stage, see action. Damage from that action might account for the slight shortening of the sword from what appears to be its original length. At 27" the blade is still long enough to be within traditional jian parameters. Typical of many antique village jian, the sword is not perfectly balanced by any means, however it is still relatively easy to handle (the point of balance being an inch or two further towards the tip of the blade than I'd prefer) and I think the sword is quite usable in forms practice (although I don't plan to use it for cutting!). Purchasing the antique jian has certainly made me appreciate the historical accuracy of the Rodell cutting jian. In the end, both are works of art: one old, one new. And both are the "real deal". Congratualtions on your 2 swords. I'm all with you, one needs to cut in order to understand one's technique. Had exactly the same weak forhand, much better backhand, when I started. I don't have any antiques, but several repros, sum fot forms work, some for cutting. I use bamboo, mostly, and it is some work to clean the juices off, do some sharpening, if necessary, rub the blade hot, oil it and bring it back into the scabbard. As it is very humid here in TW, I need to cleanse and oil the blades atleast every 6 months. Please check your blades regularily for corrosion, and any sword needs to be nourished. After many rubbings, the steel will close fine pores, getting better and better. BTW, the hole at the pommel is for a leather band, securing the blade on your wrist. Traditionally, tassels came very late and only for display, not for fighting application like some ppl suggest. Please be carefull, only work the sharp stuff when fully concentrated. Don't use them if tired or in a bad mood. All the best and lots of fun. Thanks Hermann - sage advice. And I had wondered about the hole in the pommel! All the best, my one-handed friend! Some sage advice from Hermann there! Were you intending on putting up a video of you practice cutting? Looking forward to practising with you in a couple of weeks Dan! For sure Xin. At the moment I'm still taking it easy - even cutting can impact on the back. Looking forward to seeing you and training with you again Trev! Nothing like handling the real thing! Even a little cutting will totally change your perception of every sword technique you know! I have known several weapon artists who believe they are experts. A session of cutting would humble them. I am finding this in my own martial arts system many of the iaido guys poopoo me for cutting and training with a live blade. I have found if an artist is missing any of these aspects in their weapons training they typically have wide holes in their understanding. I like that hanwei cutter. I am hoping to win one in a contest soon! I agree absolutely Erik: those are the 4 elements of swordsmanship. Thanks for your input. Please, please - start cutting tatame omote ASAP and leave plastic bottles for the amateurs. Do some research on tameshigiri (swordsmanship's version of karate tameshiwara, maybe evemn find a qulaified iaido/iaijutsu or bttodo/batto-jutsu sensei. Cheers - Paul. Thanks for your concern Paul, but I'm afraid the availability and cost of tatami omote here in my State means it won't really be something I can do in the next few months (I've seriously overspent my on my "sword budget"!). I have the wood to construct a dedicated tatami omote stand, so rest assured I will do so soon. I know exactly why tatami omote is important (how it was designed to replicate human body cuts, etc.) - and why plastic bottles don't "cut it" ;). In the meantime, Rome wasn't built in a day, and some cutting practice is better than none! I also tested with the thin mats used for sunbathing (cheaper), rolled them tight, soaked them over night in water. Another guy in HKK uses rolled newspapers. Bought tatami rolls are really not that cheap and hard to get by, even here in Asia. Thanks Hermann. Yes, I know about beach mats and newspaper as cutting target options. Tatami is better, but that doesn't mean that other targets are completely ineffective. I have to order tatami from Sydney. It works out to something like $30 for a few minutes of cutting. Realistically, how often am I going to do that? More importantly, there is nothing to suggest that tatami omote vastly superior, never mind the "one and only" cutting medium. 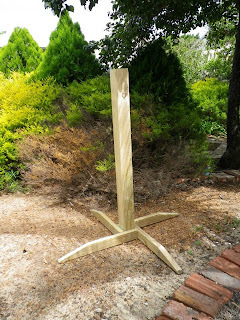 Some of the best swordsmen/women I know (Scott Rodell being just one) use a variety of different cutting targets - because they are accessible, useful and fun! One of the reasons why Obata Toshishiro prioritizes so much on cutting practice via omote tatami (1/5th of the curriculum), is because it's the only real way to test if your muscle memory is correct for slicing a consistent plane through a target. Most people can swing a stick or wooden sword. But the plane of movement that stick goes through is "wobbly". And you can't really tell, especially at full speeds. The human eye doesn't have enough FPS to detect where blades are moving in the air at speed or even sticks. They blur. So you can't use your eye detection to correct yourself. That's why sword testers in Japan used to use a experimental blade and cut through some prisoners marked for execution. The blade's quality is the variable, and they only chose swordsman with a noted ability at cutting in straight lines and planes. They didn't want anybody with a wobbly cut that would then break the sword, and have it blamed on the sword's construction. Now a days of course, we have run out of prisoners, so we need to have "alternatives". I wish you a lot of time to get accustomed to your swords, Dan. You certainly paid for it in cash. Not many people in martial arts practice the way of the sword. At least, not seriously. The video of you unpacking stuff reminds me of other sword aficionados. My first blade I bought was an iaito, mostly for training practice. The sword was a 40 some inch katana, total, and often times it felt heavy and often times it felt light. Superior balance will do that. I've seen razor sharp blades, but often times too sharp a sword is not a good thing. Cause it can cause the edge to break if you hit something hard enough. A sharp blade makes cutting tatami omote easier, which is why a lot of people want to sharpen it. At the same time, superior cutting skills make that blade go through smooth as butter, applied with all the power of the body itself. Just like in punching, incorrect power transmission makes for a lot of inefficiencies that people try to compensate for by getting a more powerful blade/muscles. I've swung that iaito around, sometimes intentionally being careless, just to see what obvious mistakes would happen and where I might accidentally cut himself. Never happened, my arms always knew where the rest of my body was and didn't deliberately hit myself. Touching the blade, of course, can always cause accidents, especially when wiping it and you're not paying attention enough. But I've heard some stories of people cutting their ear, or their shins, and I'm not "what were they doing". I tried to mimic this stuff on purpose and while I can see people can cut their own leg off, I can't quite believe that anyone with muscle control and spatial awareness would be unable to stop the blade before then. I suppose my idea of what is proper isn't what the world considers proper. Cause people have all kinds of accidents with their retail bought online swords that are too sharp for their skills to handle. A few things I might mention. Drawing the sword out of your scabbard can dull the edge. For katana, the scabbard is held upside down, with the edge up, so that gravity doesn't cut the wood through and dull the blade whe nthe blade is drawn. For two edged swords... I'm not sure exactly how you deal with that. Perhaps a total vertical draw out of the gravity well? Anyways, listening to the draw of the blade and making sure the blade does not touch the scabbard, is a good practice for making clean cuts through a single plane of a target. Visualization and imagination. Steel swords are also like spring steel and gun metal. Needs polish, oiling, all that "maintenance" work. That can get boring, but it also connects it directly to firearms, the weapon of lethal choice for humanity. Brings it "character" if you ask me. Yes, people get cut on the lower legs with sharp chin. swords, again and again. The sharper the sword, the bigger the wound. Nourishing the blade, yang jian 養劍, is a fixed term in CMA, meaning that the pores of folded carbon steel get closed through rubbing, oiling, cleasing, on and on, for hrs, for days, for yrs, and the bond will be established. Drawing a blade with two edges is done with a flat sabbard position, atleast in my training, we don't use any hanging or belt suspension gear, just carrying the weapon in the left. One good reason why Obata's Shinkendo doesn't authorize the student to use any iaito (steel non sharpened blade) or live blade (shinken) in the dojo without sufficient rank and permission. Not just a danger to themselves, but to those around them. Judging by the level of "muscle coordination" I've seen in fellow students, I can well believe that. No way am I getting in the "range" of anyone who can accidentally swing their iaito around and take out my flesh with the sharp tip. Yes, the tip is sharp or at least sharp enough to go all the way through flesh. Which I've sorta tested on lesser materials. More lethal than a handgun, yet legally it's not a weapon at all. It's a cultural artifact. See, it doesn't even have a blade on it, how can it be a weapon? yeah right. I thought the japanese used tatami and soaked it in water to make it omote for 12 hours, because it was cheap and accessible and everyone could get it. Well, if that's the case, then Westerners should be able to find a suitable substitute since importing tatami can get expensive. Even if it is local home grown, because it's made to last... but we don't want it to last. That's not the idea. Bundles of straw tied together and soaked.